David Rivera, U.S. Attorney for the Middle District of Tennessee, told The Tennessean, "As this case demonstrates, enforcing the False Claims Act remains a key priority of the U.S. Attorney's Office for the Middle District of Tennessee. The U.S. Attorney's Office and our law enforcement partners will continue to vigorously pursue those who knowingly submit false claims to government health care programs." The fact that healthcare organizations shouldn't file false claims is a no-brainer. But in many instances, these cases end up being settled because organizations don't have the appropriate documentation to back up their claims. 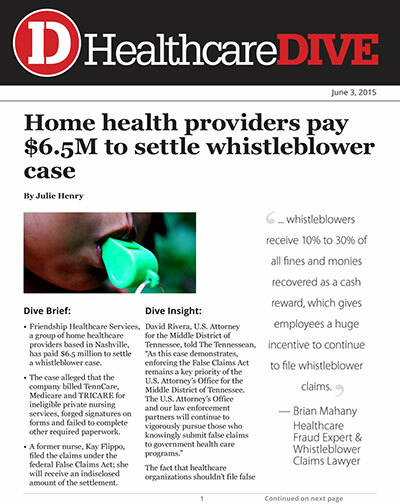 According to Brian Mahany, healthcare fraud expert and whistleblower claims lawyer, whistleblowers receive 10% to 30% of all fines and monies recovered as a cash reward, which gives employees a huge incentive to continue to file whistleblower claims. In other words, this isn't the last time you will read about a case like this.